This is Part One of a 5-part Halloween series, inspired by our annual tradition of carving pumpkins. Here are some of the most creative (yet simple!) pumpkin carvings we’ve seen lately. 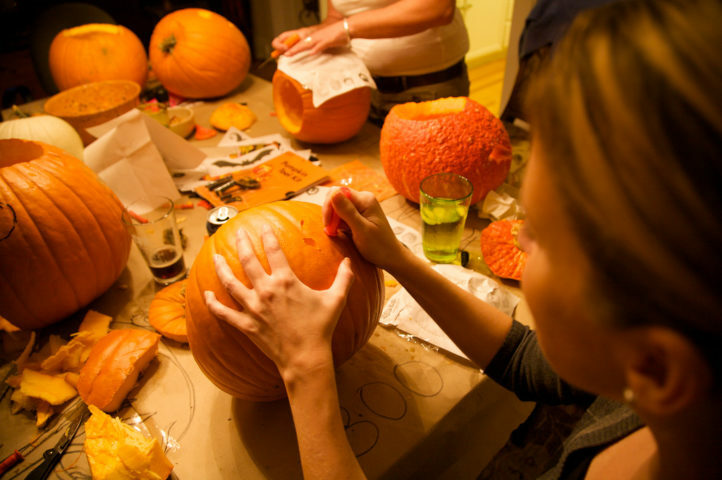 We even plan to try out a few of these ourselves this year… especially decorating pumpkin gourds & setting them on the house steps. For some unusual pumpkin carving ideas including a clever trick for carving a pumpkin on its side and displaying it sideways .. very cute! We prefer to carve designs that are of traditional Halloween-related objects, but we kick them up a notch by making them more 3D or more detailed with shading or something. If you’re interested in how we do it, check out these pumpkin pictures of jack-o-lanterns we’ve carved in the past. Here’s a Jeep template we created ourselves! For a simple, yet very personalized pumpkin face, use one of these pumpkin carving templates to create your own personal Jack-o-lantern template. There are many more free templates out there to choose from (but you’ll have to weed through a lot that aren’t so free to find them!) You’re best bet would be to search in Google for EXACTLY what you’re looking for, such as “flag pumpkin template” or “scooby doo pumpkin” or “spongebob pumpkin”… you get the idea.